An elderly woman goes to the supermarket once a month because of limited options for shopping in her neighborhood. WASHINGTON (WUSA9) — WASHINGTON -- Spry and full of life, Ms. Tibbs, an 82-year-old woman from Southeast, D.C. has no plans of slowing down. The elderly woman juggles a robust volunteer schedule at Children of Mine where she helps care for and support kids at the youth center. Once a month, Ms. Tibbs ventures from her small apartment to go grocery shopping. She goes once a month for two reasons — time and money. “I have flower, sugar, vegetables,” said Ms.Tibbs, checking her food pantry and writing a grocery list. Two hours, that's how long it takes Ms. Tibbs to go on a single shopping trip. That amount of time spent on food shopping is a lot for an 82-year-old woman. 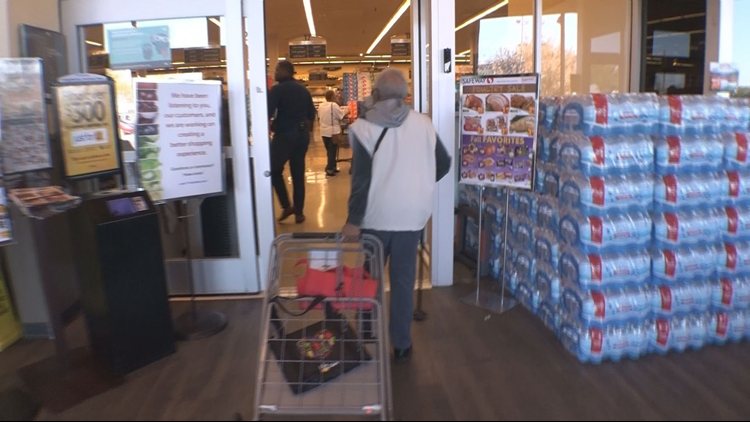 The woman, who lives in Southeast, D.C. wanted to show WUSA9 what she encounters on a typical journey to the supermarket. WUSA9's Larry Miller and Ms.Tibbs gathered her 30-pound shopping cart and made our way to the Safeway on Alabama Ave.
“This is a hassle right here,” she said trying to move her cart outside of her apartment. Ms. Tibbs travels nearly two miles from her house to the grocery store because she lives in a food desert. Food deserts are defined as areas where access to affordable fruits and vegetables is limited, primarily due to a lack of grocery stores, according the United Stated Department of Agriculture. Wards 7 and 8 of the District are considered food deserts because of the few grocery stores for the 148,000 residents that live in those two wards. To put it into perspective, Wards 7 and 8 only have three grocery stores for 148,000 residents. Ward 3, which is made up of a higher income with majority white residents has nine grocery stores. Only 83,000 residents live in Ward 3. The limited shopping options force residents, like Ms.Tibbs, to rely on nearby, costly convenience stores. “Sometimes, I have to find pennies just to put together [In order to] to come around here to get something sometimes,” she explained. We stopped by a convenience store a few blocks from her house. “If I would come in here to do grocery shopping, it would be a little bit more than at the Safeway. I would say 5 or 10 dollars more,” she said. Ms. Tibbs demonstrated the price difference with a bag of flour. “I'm not going to pay no $7.00 for 5 pounds of flour,” she made clear. A 2016 report by D.C. Hunger Solutions, an advocacy and policy organization, said the District’s grocery stores are unevenly distributed leaving lower income, African Americans east of the river without access to quality food. 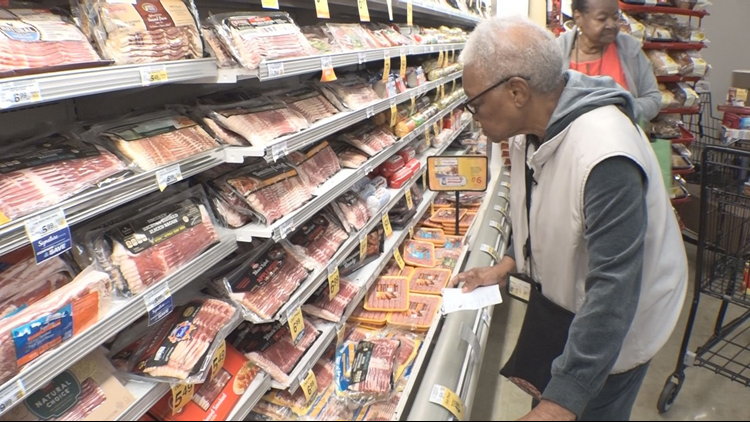 Ward 7 councilman, Vincent Gray, says potential grocers are reluctant to settle in Wards 7 and 8 because of concerns about profit margin and the cost of operation. Activists believe, however, income and race are the real contributing factors. “I know there are a number of people who think this may be racial,” said Gray. “But, I think it’s different in this instance. I think this is a situation where the economics haven't enticed some of these folks to be able to locate on the East End”. Councilman Gray along with other members on the city council are hoping to lure grocers through incentives. Three bills, two of which received the green light from the city council, offer perks to new grocers willing to open locations in Wards 7 and 8. Some of the incentives include a reduction in property taxes, an expanded length of tax reductions, and even a new building to house the store. Gray says it’s a good deal for businesses willing to take the risk. “I looked at some of the cost of operation, from some of the stores in the area and they have been running deficits. This is an effort to try and make the deficit argument moot,” he explained. WUSA9's Miller reached out to Safeway and Giant, companies that already operate stores in the east end, both declined to share the metrics they use in determining where to open a new location. However, until a grocery store opens, people like Ms.Tibbs are forced to endure the long commute to the nearest grocery store. When she and WUSA9's Miller traveled to Safeway they took a packed Metro bus. Once inside the store, Ms. Tibbs was all business, getting the items on her list including a five-pound. bag of flour which was only $3.39 compared to the $7.00 it costs at a convenience store near her house. After 40 minutes of being in the store, Miller and Ms.Tibbs were back at the bus stop. The bus was a lot more crowded on the way back and made it hard to maneuver a packed shopping cart through a jammed bus aisle. Twenty-minutes later, Ms.Tibbs and Miller made it back to her home, rounding out their two-hour trip to get groceries. “If we could get a better store, I think that would be the best thing for all of us,” she said. Despite the current challenges, Ms.Tibbs wish may be a lot closer than she realizes. Good Food markets, which owns other small grocery locations throughout the city, signed a lease and could open a new location in Ward 8 in the spring of 2019. The store would give Ward 8 its second grocery store; a step in the right direction that couldn’t come soon enough.